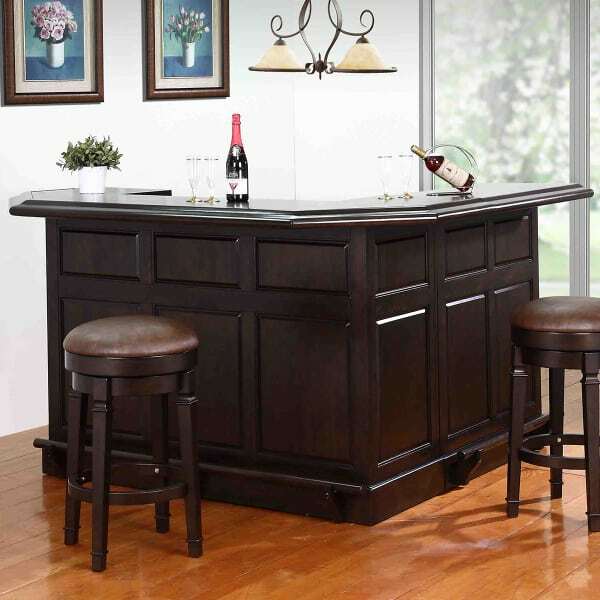 The Belvedere Return Bar is an impressive 78 inches in length, and features a combination of a bar base plus a universal return piece that may be placed on either side of the bar base. When placed together, the two-piece set includes a removable wine rack that is made for placement on the opposite side of the bar return. Also for the bar tender, there is a laminate bartending working surface, 3 full extension drawers and 2 drawers with adjustable shelves. For guests, the Belvedere features ample drinking and dining space, plus a luxe wood footrest on the front bar and bar return piece. Get your bar room game together by placing your collection of home bar necessities in one clean, organized hardwood bar room component. Now, tending to your guests’ requests is a breeze!